Earlier today I moved over from JesusFreke’s Mod to CyanogenMod. Now there is nothing wrong with JesusFreke’s but I am loving Cyanogen’s a lot more. Lot of changes and additions have been done to this mod over JesusFreke’s. It is much easier to install yet alone gain root too. But anyways, on with my post. I wanted to remove Work Email as he nicely brought this package from the MyTouch 3G into the package so you can have it on your G1. Now others like myself will probably never even use Microsoft Exchange and it weighs in at around 2MB so removing it is best if not used. Unless you have moved to sd storage as I have since August 24th but still decided to remove this and others (PDFViewer.apk and QuickOffice). While trying to remove on my own and maybe yourself to? you might run into a “read-only system” error. To be able to get rid of this type the following in Terminal Emulator. Then you are done, nothing else is necessary. If you would like to remove other apps that you are unable to uninstall just replace Mail.apk with the package name. Use the “ls” command without quotes while in “cd /system/app” (without quotes again) to see the list of apps. Disclaimer: I take NO responsibility if you mess up your phone while in Terminal and running these commands or others. Be careful and remove apps the proper way when you can. T-Mobile has released 2 new apps into the Android Market. The first one is Mobile Backup. 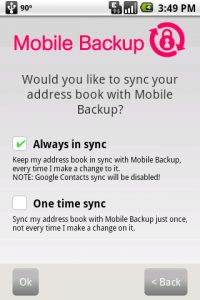 This sync’s or backups your contacts with T-Mobile’s server. That way if you lose your phone, you still have your contact with T-Mobile. This could be quite useful in case you ever get rid of the G1 for another phone where you would not be able to connect and sync your contacts with Google. 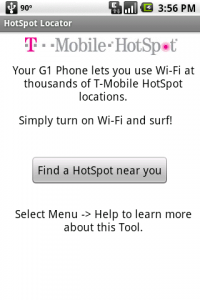 The other application released by T-Mobile is called HotSpot. Now if I remember correctly there already was another app like this in the Market. Now you officially have one by T-Mobile is all. This app will find you T-Mobile WiFi HotSpot locations. If you do not already have the app My Account by T-Mobile, then grab it already. They released months ago and it lets you check your minutes used, text messages used, bill summary, phone storage information and much more.